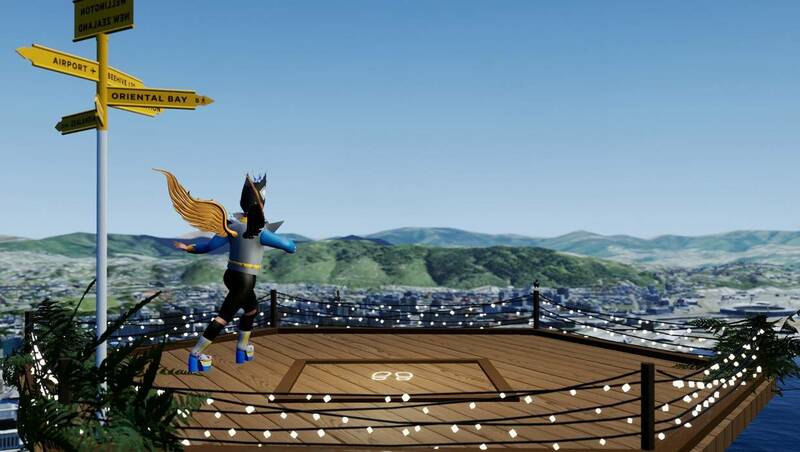 Developed by Wellington-based creative agency and self-described storytellers “Wrestler”, WellTown is a curated set of experiences set inside a virtual version of Wellington. Starting at the top of Mt. Victoria, your non-binary host will introduce you to WellTown and set you about exploring what the city has to offer in an effort to unlock expressive enhancements to your chosen avatar’s clothing. Each [game] has a vastly different style and method of engagement, making it as much a fun showcase of VR as it is of Wellington itself. The options available to explore include a mini-game where you need to sling coffees at commuter “zombies” outside of the Wellington Railway Station, one where you’re under water (thanks to an unexpected event which I won’t spoil here), and another where you’re in the bush. 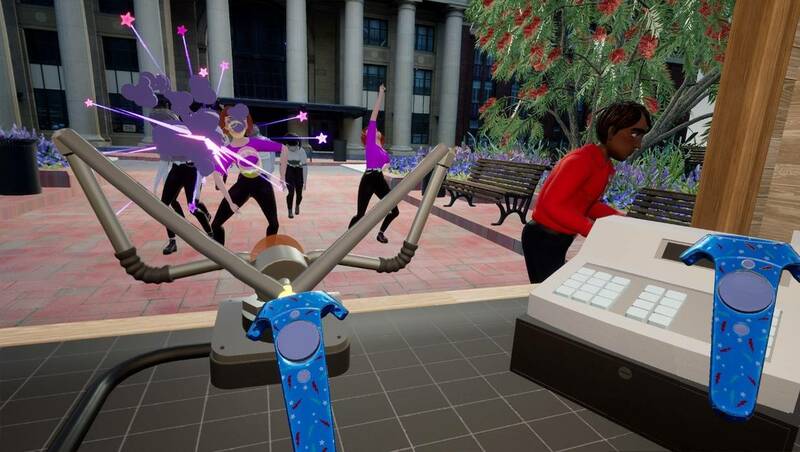 Each has a vastly different style and method of engagement, making it as much a fun showcase of VR as it is of Wellington itself. Of particular note is the spectacularly effective spatialized sound; as someone who is partially deaf in one ear, I find it very difficult to tell precisely where sounds are coming from - which can result in awkwardly looking at the wrong person in meetings. Here I had no such issues - I’d hear something behind me and bam, I could swing around and look straight at the source of the sound. experimenting with what other things you can do, lead to several delightful discoveries. The impressive sound tech is cool not only for me, but also because the team at Wrestler have done a great job in making you look around their scenes (rather than just straight ahead) which helps to contribute to the “oh! That’s why VR is awesome!” moments you really need when trying to convince someone that the expensive headset you want/bought/just got busted with is absolutely worth every cent. The sequences themselves are all worth experiencing, with the coffee game being a particular highlight. There’s lots more to it than first appears, too, and experimenting with what other things you can do (other than just operating the coffee gun) lead to several delightful discoveries. 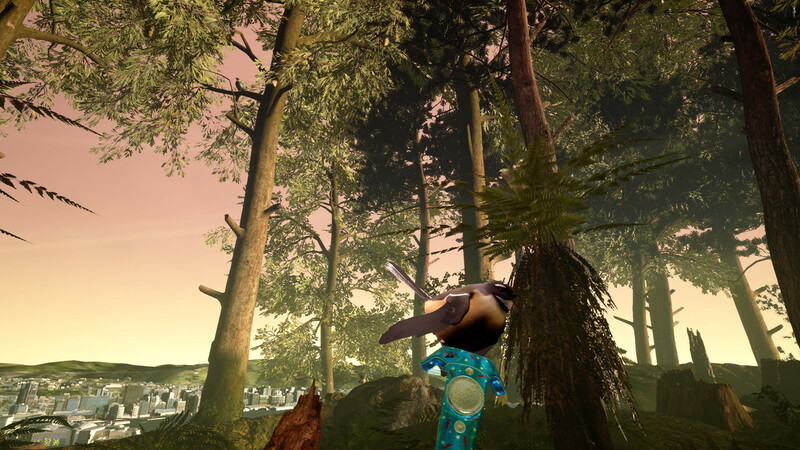 My favourite moment, however, was probably when a fantail hopped onto the virtual version of the Vive controller I was holding; it was extremely detailed and lifelike - I spent ages just looking at it as I turned the controller around in my hand. I was able to play them for an extended period without any discomfort whatsoever, which is unusual for me. The tech behind the game is Unreal, the game engine by Epic that powers oh so many video games these days, and the platform has been leveraged well. The sequences, while not blockbuster/mega-budget level impressive, are well executed and ooze that “Wellington-ness” that gives us all that slightly superior, over-caffeinated, smug, and more-likely-than-anyone-else-to-step-distractedly-in-front-of-a-bus aspect people from outside of the capital are so envious of. A lot of effort has been put into inclusiveness, too, with random ethnicity a part of the avatar creation process and the previously mentioned non-binary guide character helping to make the WellTown experience Wellington-like. The experiences themselves have also been carefully designed to prevent motion sickness; I was able to play them for an extended period without any discomfort whatsoever, which is unusual for me. If you’re lucky enough to have a top-tier headset, you can lean in and actually read the text of the Treaty of Waitangi. The six main experiences are supplemented by additional VR applets from commercial partners, including Weta Workshop (a 360-degree video brochure, if you like, for the real Workshop experience), Victoria University, Xero, and Te Papa - amongst others. While there were no plans to announce, both Wrestler and WREDA suggested that, should there be demand, there’s every reason to expect that the application will be further expanded over time. For a free application, WellTown is definitely worth a download unless you really, really don’t care about Wellington. If you don’t have a VR headset, the team plan to shoot some 2D footage from the app for consumption via YouTube and the like, with additional explorable video (you know the type - you tilt your phone to look around it) that should be consumable on headsets like the Oculus Go and Gear VR. If you’re lucky enough to have a top-tier headset (like the Vive Pro, which WellTown was demonstrated on), you can lean in and actually read the text of the Treaty of Waitangi or the women’s suffrage petition - a dazzling teaser of what the future of the workplace might look like. WellTown is available now for free on Oculus, Vive, and Steam.